General Motor India has already launched the enhanced version of Cruz with an engine upgrade and Captiva Facelift last month. It isnow back again, but this time it is bringing an all-new brand to the Indian market, the Chevrolet Sail. The Chevy Sail has already gained much of the popularity even before its launch. The company officials have already confirmed that the new Sail duo (hatchback and sedan) will replace the old and not so good performers theAveo UVA Hatchback and theAveo Sedan. But there are still some questions surrounding the new brand. The company has yet not revealed its actual launch date and also it has not made clearif both the sedan and hatchback models will be reaching the market at the same time or if they will be following each other. When contacted, GM informed us that the Sail Hatchback will be revealed first and the Sedan version will be following it at a later date. On further enquiring about the launch date of the Sail Hatchback, they indicated that its launch will take place somewhere around September or October. They also said that the launch of the Sedan version is also not very far away and it will be released just a month or two after the Hatchback. 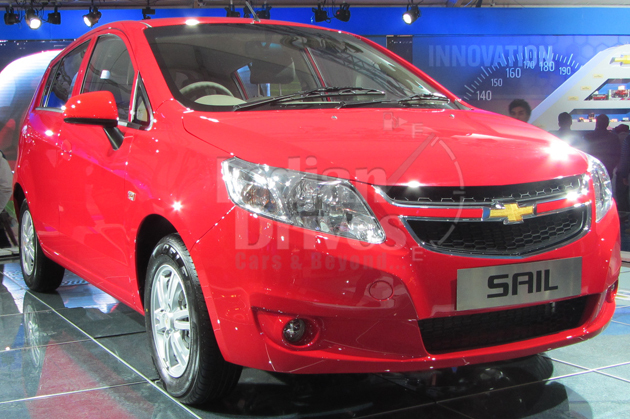 Chevrolet Sail Hatchback was revealed at this year’s Auto Expo held in Delhi. The design of the vehicle is not very unique. It does possess the front fascia with the well-established headlamps. Use of Chrome and the Chevrolet logo gives it an impressive look. The new Hatchback version will directly face the competition from the market leader Maruti Suzuki’s most selling car, the Swift. With the good wheelbase one can expect Sail to offer better spaciousness than most of the available hatchbacks in the market today. The Sail will be powered with the Smartech engine that currently powers Beat. So, mileage could be a key factor that could help itgain advantage over the other cars in the segment. Chevy is also planning to reveal Enjoy MPV which is the next car on its cards. The MPV is also expected to launch this year itself.